Unsearchable Riches Volumes and Index on DVD. High quality scans with Optical Character Recognition (OCR) of actual Unsearchable Riches volumes. Years included are 1909 – 2017. Also included on this DVD is an index of Unsearchable Riches for years 1909 – 2017. Index includes topical as well as scripture references. Unsearchable Riches Volumes and Index on DVD. High quality scans with Optical Character Recognition (OCR) of actual Unsearchable Riches volumes. Years included are 1909 – 2017. Also included on this DVD is an index of Unsearchable Riches for years 1909 – 2017. Index includes topical as well as scripture references. 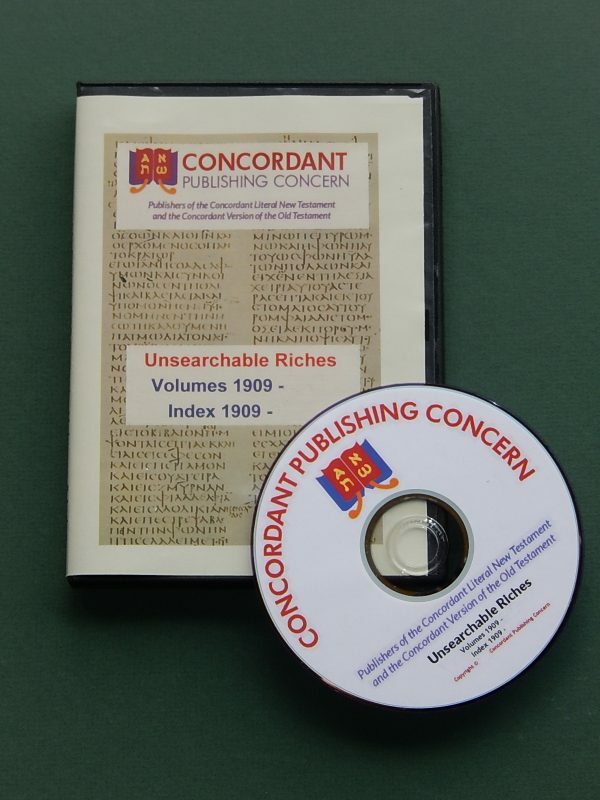 With each passing year, the DVD is updated to include the previous year Unsearchable Riches magazine. As with most all of our material, it is available for free on our website. If you wish to have the latest updated DVD, you must place a new order. This DVD should play on a PC device capable of playing DVD discs containing .pdf files.